Obviously, 2018 is an “even year”. Which means for most of the electronics assembly equipment industry: Compared to the “odd” years, November is a rather calm period. This is because there is electronica instead of productronica in Munich, as the two “sister shows” are taking turns at the Munich trade show grounds of Messe München. And electronica, as “everybody” knows, is a very much “components-centric” trade show; “machines” or even full assembly lines are not in focus. Accordingly – although electronica is significantly bigger than productronica (about twice the size and visitors and almost three times in exhibitors) – the “even years”- show in Munich is not a key exhibition event for the “assembly line” – industry. 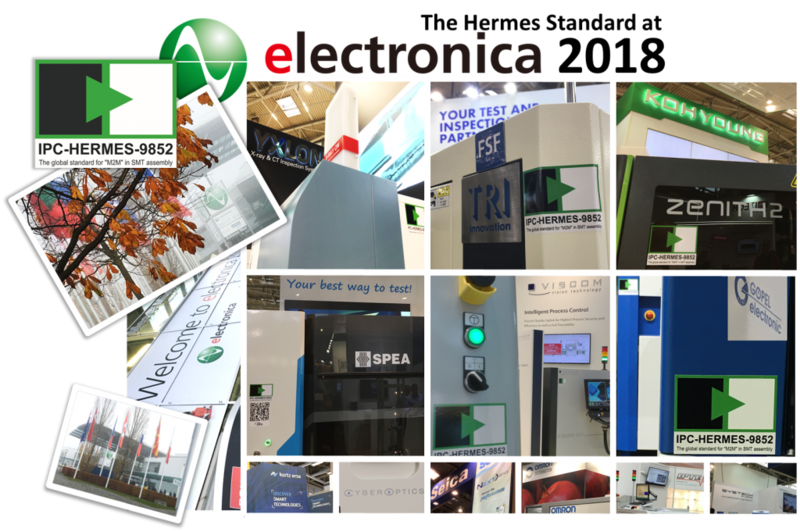 Except of course for the “inspection & test” equipment faction, which has a dedicated hall (A3) at electronica. Accordingly, this very hall was the place to be for a couple of members of The Hermes Standard initiative who have inspection and test equipment in their portfolio, proud to present their products to many visitors. By this, The Hermes Standard was present at the show as well with green stickers designating hot spots of factory integration! It was good to see the comittment of The Hermes Standard Initiative members even at this exhibition, where only a few visitors may have known before about The Hermes Standard . Yet by now it will be quite a number of additional people having heard about IPC-HERMES-9852, the next generation technology for “SMEMA”. Thank You very much to all The Hermes Standard Initiative members at electronica. We hope you had a very successful time in Munich. Looking forward to see you all (the very very latest) back in Munich by November 2019, when there is again an “odd year”.